A humble 5-cent coin with a storied past is headed to auction and bidding is expected to top $2 million a century after it was mysteriously minted. It is expected to fetch $2.5 million or more when it goes on the auction block April 25 in suburban Chicago. “Basically a coin with a story and a rarity will trump everything else,” said Douglas Mudd, curator of the American Numismatic Association Money Museum in Colorado Springs, Colo., which has held the coin for most of the past 10 years. He expects it could bring more than Heritage Auction’s estimate, perhaps $4 million and even up to $5 million. The nickel made its debut in a most unusual way. It was struck at the Philadelphia mint in late 1912, the final year of its issue, but with the year 1913 cast on its face – the same year the beloved Buffalo Head nickel was introduced. The coins’ existence wasn’t known until Brown offered them for sale at the American Numismatic Association Convention in Chicago in 1920, beyond the statute of limitations. The five remained together under various owners until the set was broken up in 1942. 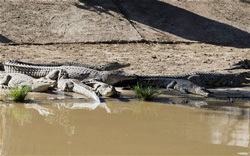 The search continues for nearly half of the 15,000 crocodiles still on the loose after the owners of Rakwena Crocodile Farm, on the Limpopo River in northern South Africa, were forced to open their gates to prevent a storm surge earlier this week. Zane Langman, whose in-laws own the farm, advised neighbouring residents that under no circumstances should they attempt to capture a crocodile by its tail. “The animal will turn around and bite you,” he warned. It would also be unwise to attempt to feed the beasts, he said. Instead, he said residents should steer clear of wandering crocodiles, which have now spread far and wide, with one spotted on the rugby pitch of a school 75 miles away. If one did come across a crocodile, Mr Langman told the Afrikaans-language Beeld newspaper, the best thing to do was to try to barricade it, and keep it in the shade. Search teams are working flat-out to catch the crocodiles, though it is easier to find them at night because their eyes glow red under the light of a flashlight. The surrounding South African province of Limpopo has been hit by serious floods, which have killed 10 people and left many more homeless. In the nearby Kruger National Park, nearly 100 tourists and staff were evacuated after swollen rivers deluged camps and roads. The floods have also ravaged neighboring Mozambique, where tens of thousands of people were being evacuated from their homes. Manuela disappeared from her home in Rio de Janeiro, Brazil, in 1982 and despite a lengthy search was never seen again. Her owners, the Almeida family, assumed she had run away after builders working on the house left the front door open. 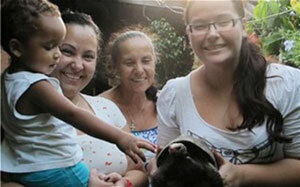 Rio de Janeiro vet Jeferson Pires explained that Manuela’s red-footed species of tortoise, can go for long periods without eating. He said: “They are particularly resilient and can survive for two to three years without food. In the wild they eat fruit, leaves, [and] dead animals…” He said Manuela may have survived by eating termites from the wooden floor. 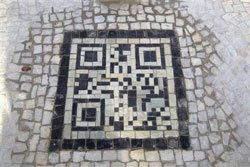 Rio de Janeiro is mixing technology with tradition to provide tourists information about the city by embedding bar codes into the black and white mosaic sidewalks that are a symbol of the city. The first two-dimensional bar codes, or QR codes, as they’re known, were installed Friday at Arpoador, a massive boulder that rises at the end of Ipanema beach. The image was built into the sidewalk with the same black and white stones that decorate sidewalks around town with mosaics of waves, fish and abstract images. The launch attracted onlookers, who downloaded an application to their smartphones or tablets and photographed the icon. The app read the code and they were then taken to a web site that gave them information in Portuguese, Spanish or English, and a map of the area. The city plans to install 30 of these QR codes at beaches, vistas, and historic sites, so Rio’s approximately 2 million foreign visitors can learn about the city as they walk around. “If you add the number of Brazilian tourists, this tool has a great potential to be useful,” said Marcos Correa Bento, head of the city’s conservation and public works. Raul Oliveira Neto, a 24-year-old visitor from the Southern Brazilian city of Porto Alegre, was one of the first to use the icon and thought the service fit well with the way people live now. Locals – used to giving visitors directions – also approved the novelty. “Look, there’s a little map; it even shows you where we are,” said Diego Fortunato, 25, as he pulled up information.